MailChimp is an amazing way to generate revenue for your business, but what happens when it stops being free? The Forever Free plan only lets you have 2,000 subscribers on your mailing list. Once you hit this mark, you need to start a monthly subscription. But before you start forking out some extra cash to keep your email campaigns going, read our guide for staying under 2,000 subscribers. Go to the list you’re concerned about. Click “Contacts match” and then select “all” in the drop-menu. Select the box next to all the subscribers you want to delete. You may need to utilize the bulk unsubscribe strategy. Select “Actions” and choose “Unsubscribe” in the drop-down menu. This is just one way to keep your list full of people who are engaged. Click “Contacts match” and then select “any” in the drop-menu. Filter the contacts by selecting “Contact Rating,” “is less than,” and “2 stars.” This creates a segment of subscribers who have a one-star rating. Select the box next to all the subscribers you want to delete. You may need to utilize the bulk unsubscribe tool. This will remove all your subscribers who barely engage or don’t engage with your campaigns at all. Select “Export as CSV” to get a spreadsheet file of the email address. Open the CSV spreadsheet, select all the email addresses, and copy them. 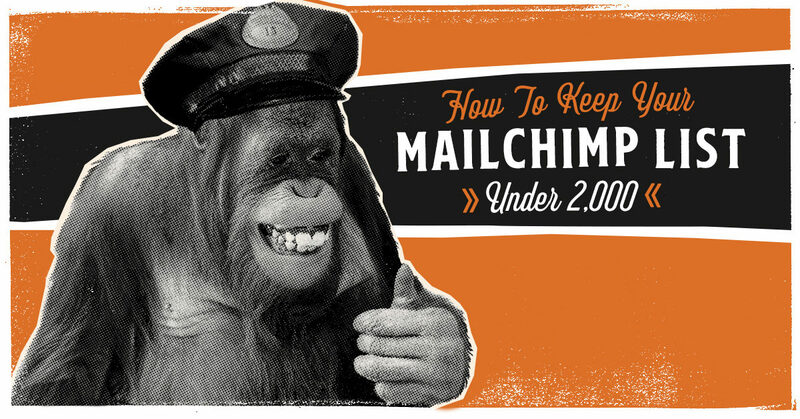 Go back to the “Unsubscribe page” on MailChimp. This method is especially useful if you have hundreds of inactive subscribers. If your newsletter is growing and successful, you may still be over 2,000 if you delete your subscribers or quickly get back to this problem. First, you should be excited that you have so many people who want to stay connected to your campaigns! If you’re experiencing this issue, you can choose to upgrade your MailChimp account and work to offset the monthly fees. By monetizing these subscribers with effective email marketing, you can easily make back the $25 or $30 you’ll pay for an upgraded account. Managing your email list can get frustrating. If you’re having trouble keeping your subscribers active or making enough sales to cover the costs of a MailChimp upgrade, you need a marketing partner. Clicks and Clients provides advice and marketing strategies that will make your email campaigns be more lucrative than ever. Learn how we can take your mailing list to the next level.